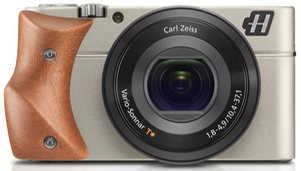 If you liked paying US$7000 for a US$1200 camera (Hasselblad Lunar versus NEX-7), you'll probably enjoy paying US$1600 or more for a US$700 camera decked out with a wood grip. The same logic that many called Lunarcy, now can be found in a Stellar mistake. Hasselblad has taken a Sony RX-100 (not an RX-100II, mind you), retooled the housing material and controls with your choice of wood grip, and come up with the Hasselblad Stellar. Heck, you don't even get as much wood as you did with the Lunar. But you still get the price bump: US$2000 or so for the lowest cost version, up to US$3200 for the highest cost version. At least when Leica makes high-priced variations of lower end cameras, they not only make their own, but they attempt to bring a Leica-level of image quality to the fore (that isn't to knock Sony, but Sony's target is generally high, consumer-level image quality, while Leica's is more targeting the pixel peepers, which is where Hasselblad should be, too). I'm not sure what Hasselblad is trying to prove; that they're really a good woodworker, maybe? Certainly there's no growth prospect in medium format cameras, Hasselblad's forte, but it just strikes me as completely out of character to turn from being a high-end purveyor of image quality to being a bling artist. While I'm sure there are a few suckers—uh, I mean customers—that can convince themselves they're buying a valuable collector's item with the Lunar and Stellar, I don't see how that keeps Hasselblad in business for long. Given how many OEM options there are out there these days, I'm pretty sure they could have designed their own high-quality compact camera if there's really a market for multi-thousand dollar compacts. Let's see, Hasselblad's already covered moons and stars in their names. What astronomical things are left for the inevitable blinged out RX1 and Alpha? Probably some planetary name is next. But my I suggest something more fitting their likely sales rate? Black Void. Hasselblad didn't make things any easier on themselves. Clicking on the banner on the USA Web site for the Stellar leads to a Web site that apparently doesn't exist at the moment. I believe we're going to lose some camera makers in the coming years. Hasselblad is showing all the signs of volunteering to be first.